Audi has launched the A3 facelift in the country at a starting price of Rs 30.5 lakh (ex-showroom, Delhi). The A3 was introduced for the first time in 2014 and is the most affordable sedan from the German automaker in the Indian market. Its primary rival, the Mercedes-Benz CLA , was updated last year. Both the cars are entry-level luxury sedans and fall in the same price range. However, if you are looking for a premium sedan in the same price range, the Skoda Superb is also a very good option. Not only is the Superb based on the same MQB platform as the A3 but it is also powered by the same engine as the A3 (different state of tune). 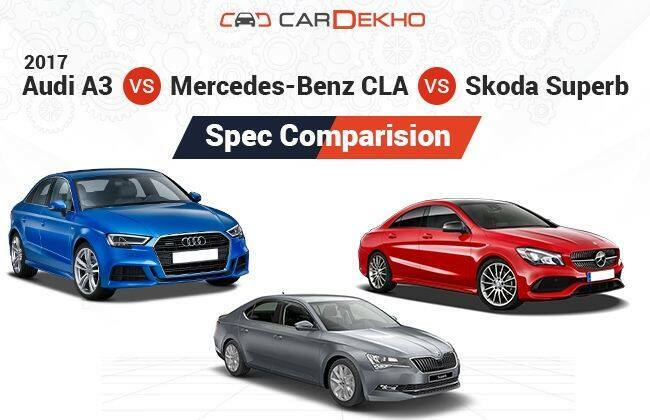 Let's compare the specifications of all three cars and try to figure out which one suits you the best. You should have already guessed it: yes, the Skoda Superb is the most spacious car here without any doubt. It is longer, wider, taller and also has a longer wheelbase as compared to the other two cars. However, when we compare the Merc and Audi, the Merc is longer in length and even has a longer wheelbase than the Audi A3. While the Merc and Audi have boot space of 470 litres and 425 litres respectively, the Skoda has a massive boot of 625 litres. While the Merc is powered by a 2.0-litre petrol engine the Audi and Skoda have a 1.4-litre and 1.8-litre engine respectively. As expected, the Merc has the most powerful engine that produces 180PS of power. However, the petrol engine on the manual variant of the Skoda Superb has a higher torque of 320Nm. As the Audi has the smallest petrol engine in this comparison, it comes last in terms of power but it does return the highest fuel efficiency of 19.2 kmpl. The A3 was earlier powered by a 1.8-litre engine however, Audi decided to replace it with the 1.4-litre unit in the facelift. When it comes to transmission, both the Audi and Mercedes have a seven-speed automatic gearbox; however, the Skoda has a six-speed manual transmission with an optional seven-speed automatic transmission. When it comes to diesel the Mercedes again has the biggest engine in the comparison, a 2.2-litre unit. However, the 2.0-litre diesel engine on the Skoda Superb is the most powerful among the three and surprisingly, the Merc stands last in terms of power and torque. The Audi also has the same 2.0-litre diesel engine as the Skoda but the one in the Skoda is tuned to produce more power and torque: 177PS and 350Nm. While the Skoda and Audi have a six-speed automatic transmission, the Mercedes has a seven-speed unit. As in the case with the petrol, the Audi also has the most fuel efficient diesel engine that gives a mileage of 20.38 kmpl. While the Skoda Superb starts at Rs 24.9 lakh and goes up to Rs 32 lakh, the Mercedes-Benz CLA has a starting price of Rs 31.9 lakh and can cost up to Rs 35.2 lakh for the top-spec variant. The new A3 starts at Rs 30.5 Lakh and goes up to Rs 35.6 lakh. The Skoda Superb does appear to be a value-for-money car here as it is spacious and powerful at the same time. However, the Superb misses some features offered with the other two cars like LED headlamps, and most important, doesn't give you the pride of owning a sedan from a luxury brand.